Wario standing on one of the Magnets. 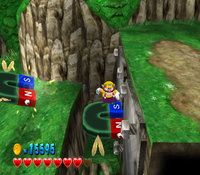 Monstrous Magnets are enemies in Wario World. They resemble large, flying green magnets with one red "N" end and one blue "S" end, representing the North and South poles on conventional magnets. They appear in Beanstalk Way, the second stage of Thrillsville. They try to attack Wario by firing electrical blasts of energy at him. Wario can use them to get to higher places by throwing them headfirst onto metal boards, which they stick to for a short time. Similar enemies, called Flying Shovels, appear in Pecan Sands. This page was last edited on November 28, 2017, at 15:57.